Pure Enrichment's Travel Ultrasonic Humidifier makes it convenient and easy to moisturize the dry air wherever you go. 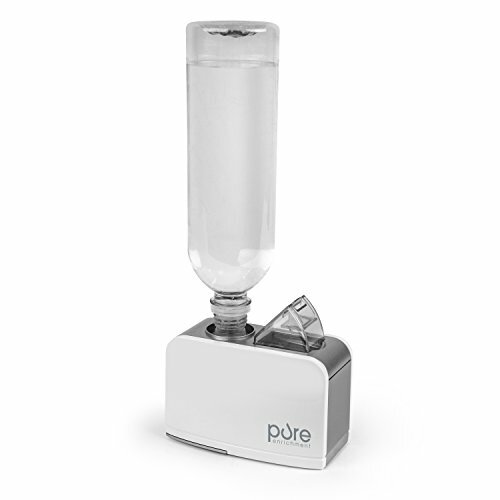 Our portable tabletop unit uses most individual water bottles to improve the air quality at home, in the office, or in your hotel room when traveling. This unit is backed by Pure Enrichment's industry-leading 2 Year Warranty so your satisfaction is guaranteed! Advanced Humidity Technology: Ultrasonic technology provides up to 6 hours* of continuous operation per water bottle (not included). Adjustable Mist Control: Mist output dial allows you to control the level of moisture in the room. Whisper Quiet Operation: Silent operation is quiet enough for a nursery or office. Automatic Shut-Off: Safety feature turns humidifier off automatically when water bottle (not included) is empty. *Run time may vary depending on water quality, room temperature and bottle size.